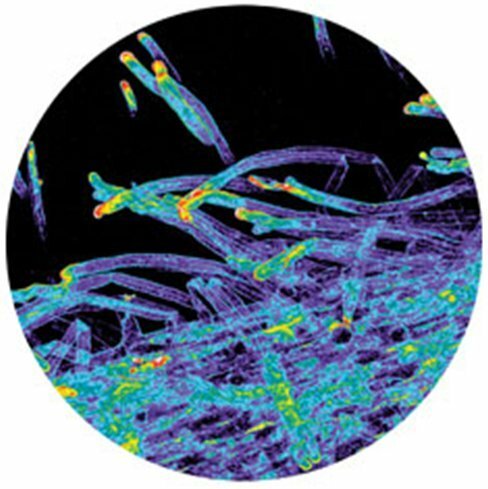 Scientists at Pacific Northwest National Laboratory and EMSL will provide proteomics expertise and capabilities to study soybean root hairs and their response to changing climate conditions. Their ultimate goal is to better understand the impacts of climate on plant root physiology. This work is part of a newly funded U.S. Department of Energy/Department of Agriculture project led by the University of Missouri, Columbia to explore the biology of a single plant cell type, while gaining novel insight into the impacts of temperature and water availability on a crucial root cell necessary for nutrient uptake. Dr. Gary Stacey, Endowed Professor of Soybean Biotechnology at the University of Missouri, is the principal investigator. Dr. David Koppenaal and Dr. Ljiljana Paša-Tolic, staff members at PNNL, are co-investigators on the $1.1 million project. To define the proteomic response of the soybean root hair cell to variations in temperature and water availability, the researchers will use mass spectrometers housed at EMSL, a DOE scientific user facility located at PNNL. The joint DOE/USDA program is aimed at improving and accelerating genetic breeding programs to create plants better suited for bioenergy production. For more information, see the program description and the news releases in the Tri-City Herald and in the U.S. Department of Energy's press release.